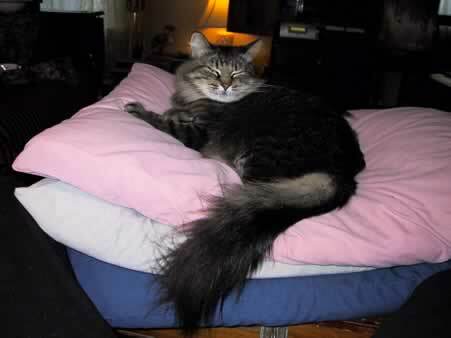 In the spring and summer of 1998, a young, fluffy cat started meeting Barbara on our back deck when she got home from work. By the time the rain came in the fall, he'd figured out the cat door and started sleeping on the laundry in the back hall, figuring out that there was an opening for a peppy male cat amongst our two spinsters. By winter he'd pretty much moved in full-time and we started vetting him. At first, Barbara just called him Boy Kitty. But during a particularly energetic bout of chasing a string on a pole (something Barbara had put together to help us try to run off some of his cabin fever that first winter) with A&E's "Biography" on in the background, an episode provided the perfect name for a cat who would run full tilt into a chest, stand up, and shake off the hit to get back to the chase: Jackie Chan. His personality is incredibly sweet, although he's always liked to tussle with my hand (leaving a fair number of shallow scratches over the years) and there are some spots where arthritis in his back will bring out a warning bite. He was good company five years ago when I broke my leg, although he did tend to hog the pillows I was supposed to be using to elevate the afflicted member. I've made a running joke out of the softness of his fur, saying that it's like "scratching the belly of a cloud" or "having your hand mauled by a cloud." A few weeks back, after touching one of Jackie Chan's sensitive spots, Barbara's sister Marie came up "The Cloud That Will Bite You," which had the three of us in stitches for no particular reason. Because he came over the back fence, we don't have any idea of Jackie Chan's actual birthdate, but from the age he was when he started appearing, we figured he was from a late fall litter, so we just picked our all-purpose non-Christmas holiday, which makes him ten years old today!